A writer writes about what he knows. I’ve heard that many times over the years. 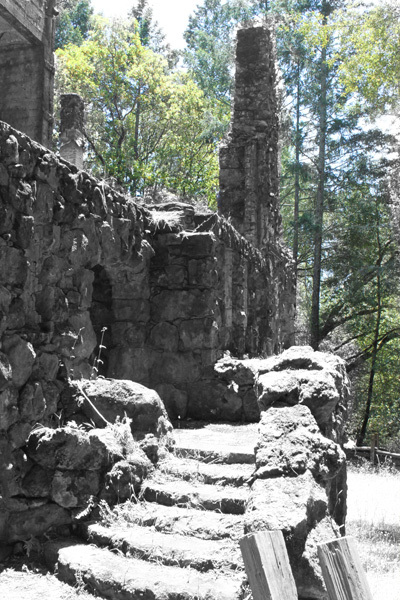 On this particular day I was hiking a short distance to see the dream home of a prolific writer from the early 1900’s. Jack London was a man who lived adventure in order to write about it. It was a short half mile before we came to the ruins of “Wolf House”, Jack’s pet name. The man, the writer, the father, the husband was said to die at age 40. Some discrepancies exist for his early demise. The bigger mystery was why his mansion burned down before he and his second wife could move in for occupation. My husband and I wandered the public grounds. Where the signs discouraged access, I chose to get a closer look. The elements had taken their toll upon the walls over the years. My feet climbed what had clearly been marble steps from years gone by. They now resembled the unpolished rocks they had originally been hewn from. I wandered the halls and rooms of a man’s dream, wondering about the deeper purposes to life. Beneath my feet I could feel the crunch of dried moss. The wild had overgrown this dream. Everywhere were iron bars to reinforce the structure of a fallen household. I made my way past an empty reflection pool to hear the buzzing of a hornet’s nest built within a fireplace never fired.